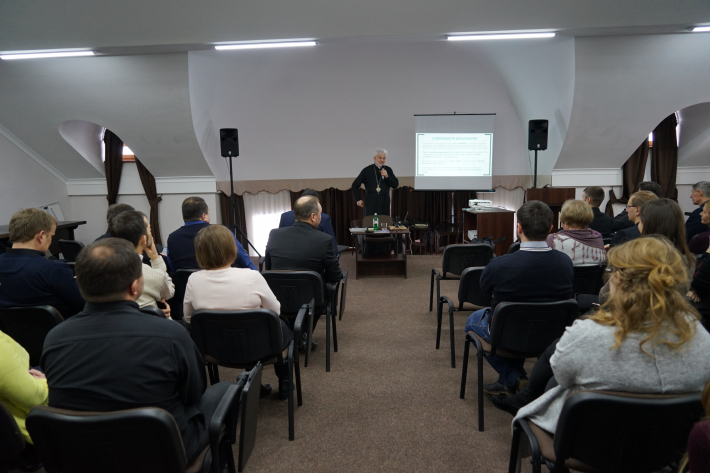 On January 26, 2019, in the Patriarchal House in Lviv there was a presentation of the decade-long activity of the Pastoral-Migration Department (PMD). In general, Bishop Yosyf Milyan, head of the Pastoral and Migration Department of the UGCC, told that the PMD monitors the situation of the faithful of the UGCC in many countries of the world. Moreover, PMD actively cooperates with the Ministry of Foreign Affairs of Ukraine and the diplomatic corps. For example, negotiations are under way with the South African Republic and Thailand. "The Ukrainian Greek Catholic Church is a global Church, the faithful of which live throughout the world, therefore the work of the Pastoral-Migration Department is important. It helps to ensure the spiritual needs of Ukrainian-Greek Catholics who are not covered by institutional pastoral care," said in his speech to those present Fr. Andriy Maximovich, administrator of the Patriarchal Curia. It should be noted that Bishop Yosyf Milian also shared plans that are going to be implemented shortly: to join the creation of the Missionary Institute of the UGCC (which purpose would be to prepare pastors for service in those countries where there is no hierarchical structure of the UGCC); to participate in the development of our communities in countries where there is no UGCC structure; conduct missionary education for laity in order to inform, form and invite them to engage in responsible co-operation. According to the head of the department, this is why twice a year the PMD issues "Obizhnyk" in order to inform the faithful of the UGCC in Ukraine and in the settlements about the evangelical needs of our Church in areas where there are no hierarchical structures. In addition, the newly elected head of the Department for the Development of the Patriarchal Curia Fr. Volodymyr Malchin is convinced that the successful implementation of projects takes place through several important stages: gratitude (for each donor / charity organization; there is a large number of anonymous donors who donate their funds for a good cause); productivity / fruitfulness (i.e., project support is a dedicated resource for implementing the idea) and transparency (this is a consensus exam in the process and at the end of the project: how am I using a resource that is purposefully allocated to me?) He also adds that a certain idea is worth it when it is embodied in two main directions: the Church's evangelizing mission and the transformation of society. After the presentation of the PMV, the Curia workers had the opportunity to attend the festive concert of the Impressions group, which performed the carols. The Pastoral and Migration Division (PMD) was created in 2008 by the Synod of Bishops of the UGCC to develop a strategy for the faithful of the UGCC at the places where they were sent, where there is no hierarchical structure of our Church. The Department is an auxiliary body under the Head of the UGCC and the Synod of Bishops of the UGCC in the area of pastoral care of the faithful of the UGCC in territories where there are no hierarchical structures of the UGCC. In 2014, the Synod of Bishops changed the name, so the correct name is the Pastoral Migration Department (http://pmv.ugcc.org.ua).